We are Europe’s Largest Multi-Vendor IT Repair Centre. Our Repair Centres in England, Wales, Holland, and Germany have successfully completed more than 2 Million IT Repairs. Our combination of unmatched repair experience and a tried and tested RMA logistics system enable us to provide unbeatable third-party RMA and Repair Services which will enhance the overall goodwill and loyalty to your brand. 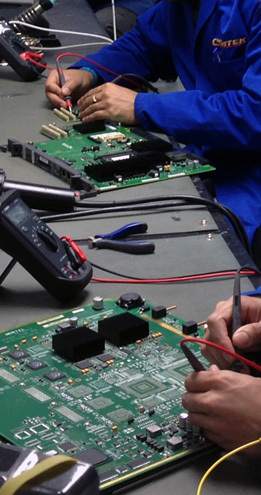 Comtek specialises in the repair of complex IT hardware and is the logical choice of manufacturers for third-party RMA, Reverse Logistics, and Repair services. Our experienced RMA staff and proven logistical systems are used by some of the world’s largest manufacturers of IT equipment. Having your own in-house RMA staff, test engineers, repair services and warehouse facilities to process your own organization’s product warranty and repair services can be expensive and a distraction from your company’s core activities. Comtek’s third-party RMA & Repair Service allows manufacturers and distributors to concentrate on selling and distributing products, the activities that they do best. RMA and Repair Services are best performed by third party specialists who are experienced in testing, repairing, and logistically processing IT hardware. Comtek’s RMA services range from verification of warranty coverage and rapid product replacement, through to RMA product testing and repair. Each third-party RMA operation agreement is individually tailored to the manufacturer’s specific requirements. RMA services are offered to both manufacturers and distributors. Comtek Network Systems (UK) Ltd.